It’s pretty safe to say that no one who plans to get married ever plans to get a divorce. Yet sadly, statistics indicate that it indeed happens to many couples. According to published reports, over 40 percent of first marriages, approximately 60 percent of second marriages and an overwhelming 73 percent of third marriages will end with husbands and wives standing before a judge requesting that their marriage be dissolved. Yet aside from the fact that divorce is a truly difficult experience for the couple, it’s also challenging for their children, family members and friends and some say, even the community at large. That’s because there are many people who believe that family is the cornerstone upon which so many things are built. And so, when even one family breaks apart, there’s a domino effect that can be truly devastating. But what do you do if you’re in a troubled marriage? What steps can you take to stop a divorce when it seems like that is the only solution? Here are five tips that can help you and your spouse to find some light of hope and to take steps towards healing your relationship. Just like you had to choose to get married, divorce is always a choice. The awesome thing about this point is it means that you and your spouse have the power to prevent the end of your marriage from happening. The great thing is it all starts with the decision to not even bring up the word “divorce” in your conversations. Be hurt. Be upset. Be frustrated. But also be the kind of couple who is determined to not let divorce ever be an option within your home. This one simple tip can take your marriage a really long way. A wise man once said that in the moments when you feel like quitting something, remember why you started. On your wedding day, you and your partner took vows to be there for one another—through it all. This means that no matter what, you are committed to having one another’s back. Sure it might be challenging now, but there’s a pretty good chance that you can be more effective working through things together than apart. You got married, in part, to be one another’s support system. The hard times would be the time to come together; not pull away from one another. “For better or for worse”. This is a phrase that you probably said as you recited your wedding vows. And although it might seem like a non-stop influx of “for worse”, you’ve got to remember that seasons come and seasons go. Winter doesn’t last forever and neither do hard times. Don’t focus so much on the past that you lose hope that there will be happiness in the future. There’s no doubt about it. One of the most effective ways to stop a divorce is to see a counselor. 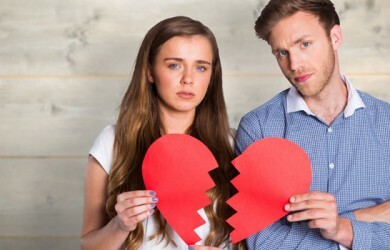 They are professionally skilled and qualified to provide you with tips and tools for how to work through the issues that you’re currently having and also how to prevent things from escalating to the point of considering divorce in the future. Something that all married couples need are other married couples; more specifically, other healthy married couples. Although no marriage is perfect (and that’s because no two people are perfect), the good news is that there are marriages that are flourishing. That’s because the husband and wife are committed to loving one another, respecting one another and staying together until death parts them. Having that kind of influence in your life can be just what you need in order to get you and your spouse through some of the hard times. Everyone needs support, including married couples. And some of the best support are other healthy and happy married friends.